Abdominal aortic aneurysm (AAA) rupture is a significant cause of mortality in developed countries. The growth rate and the rupture of AAA may be unpredictable. 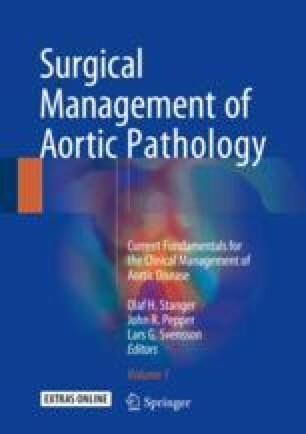 This chapter places a special emphasis on evaluating patient-specific approaches to the risk of rupture of AAA, using imaging. Specifically, we describe two pathways of assessing this risk: one being the use of morphologic imaging data to compute wall stress (and wall stress-related parameters) via finite element simulation (FES) and the other, the use of 18F-fluorodeoxyglucose (FDG) positron emission tomography (PET) to assess biological processes in the aortic wall components. Both methods are described, along with the limits preventing their widespread use. Nevertheless, the current diameter-based clinical scenarios could be yet impacted by the reported value of FES and FDG PET to predict the risk of AAA rupture. Lastly, the relationship between wall stress and the biological activities as described by FDG PET points at least partially to genetic or acquired alterations of the arterial wall response to wall stress, which can be found in familial aneurysms or in smokers, for example. An integrated patient-specific risk assessment strategy that would include imaging parameters along with personal and heritable risk factors is becoming increasingly suitable.